Putin wants to keep his ill-gotten gains and has his puppet premier issue war threats. Will Trump hand over Georgia as well? MOSCOW (AP) — An attempt by NATO to incorporate the former Soviet republic of Georgia could trigger a new, “horrible” conflict, Russia’s prime minister said Tuesday in a stern warning to the West marking 10 years since the Russia-Georgia war. Medvedev was Russia’s president during the August 2008 war, which erupted when Georgian troops tried unsuccessfully to regain control over the Moscow-backed breakaway province of South Ossetia and Russia sent troops that routed the Georgian military in five days of fighting. The Russian army was poised to advance on the Georgian capital, but Medvedev rolled it back, accepting a truce mediated by the European Union. The European Union on Tuesday reiterated its “firm support to the sovereignty and territorial integrity of Georgia within its internationally recognized borders” and lamented the Russian military presence in Abkhazia and South Ossetia. In a show of support for Georgia, foreign ministers of Latvia, Lithuania and Poland, and a Cabinet member from Ukraine, visited Tbilisi Tuesday, urging Russia to withdraw its troops from Abkhazia and South Ossetia. “Nowadays no country can change the borders of another country by force,” said Polish Foreign Minister Jacek Czaputowicz. Medvedev warned that NATO’s attempt to embrace Georgia could have catastrophic consequences. Medvedev pointed to Moscow’s recognition of independence of Abkhazia and South Ossetia and the Russian military bases there, saying that any attempt to change the status quo could lead to “extremely grave consequences.” ?I hope that NATO’s leadership will be smart enough not to take any steps in that direction,” he said. The Russian prime minister described NATO’s eastward expansion as a major security threat to Russia. Edited 1 time(s). Last edit at 08/07/2018 11:47AM by Steve G.. I'm guessing that Trump's response to this was decided in Helsinki. It was decided before that. 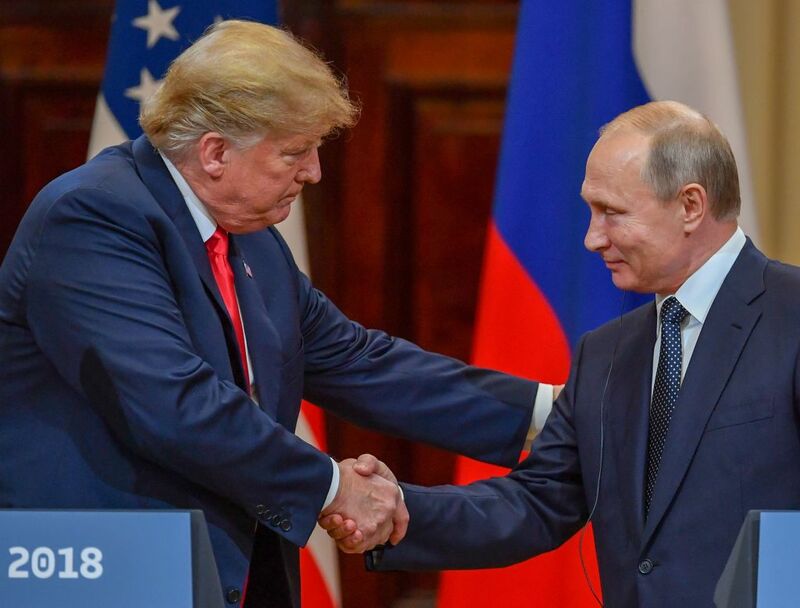 He was just told what it was in Helsinki. The ball is in the court of the European Union. oh, THAT Georgia. for a second there i thought my home state was getting a bit to big for its britches. Horrible conflict... Too many lives have already been jeopardized. Anyone with a conscience should have taken the opportunity to get two birds with one stone on that day. The prospect of more - actual - deaths engineered by those men is unpalatable in the extreme. Interpol, take these criminals DOWN!